In Eph 6:21-24, the Apostle Paul comes to the end of his deeply theology, yet wisely practical, letter to the Ephesians. He does so by touching on the main themes of his letter (grace, peace, faith, love) and calling the church – and us – to “love incorruptible”. 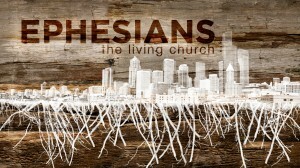 Today we come to the Paul’s great letter to the Ephesians (modern day, Turkey). The first half (chapters 1-3) paint a huge cosmic picture of God’s story and purposes in the universe (1:10) which we are all part of. Though sin has broken God’s good creation, God has set out to make all things right thru Jesus Christ (2:1-10). Though his life, death and resurrection, God offers us forgiveness of sin and restored relationship with Him. Together, followers of Jesus form a new redeemed humanity, literally a new society, the church. In the last half of the letter (chapters 4-6), in light of all that God has done through Jesus on our behalf, Paul calls us to live a life worthy of the calling that we have received. This is life marked by unity, purity and mutual dependency (4:1-16). It is a life spent putting off the “old self”, being renewed in spirit of our minds, and putting on the “new self” (4:22-24). It is a life empowered by the Holy Spirit (5:18) and shaped by the gospel (5:22-6:9). It is a life spent putting on the whole armor of God (6:10-20), which is putting on the blessings and privileges of the gospel of Jesus. Today, Paul concludes his letter, by giving us insight into the motivation and power behind an ordinary life lived with gospel intentionality. Q: What could move someone to give up a normal, comfortable life in province of Asia? Paul opened his letter, as he commonly does, with a welcome of “grace to you and peace from God our Father and the Lord Jesus Christ.” (1:2) Grace and peace is possibly the shortest summation of the gospel. We have peace with God via the grace of God. Paul repeats the same sentiment here, though he is careful to emphasize the source of each: love. What are you looking to for a sense of security, makes you feel loved? Most mass, life is orbiting around? Maybe its a relationship, career, money, sexual pleasure, being understood, comfort, control, etc. Whatever you love most will define and shape the trajectory of our life. You love most what is most lovely to you. You glorify most what is most glorious to you. You treasure most what is of greatest worth to you. In other words, the primary object of love in your life will determine the primary objectives of your life. Ex. Object: Money. Objectives: Make decisions you believe will maximize your take home, over all else. Ex. Object: Kids. Objectives: Make decisions you believe will produce the best environment, over all else. Ex. Object: Career. Objectives: Make decisions you believe will produce most success, over all else. Ex. Object: Pleasure. Objectives. Make decisions you believe will maximize pleasure, over all else. Ex. Object: Comfort. Objectives. Make decisions you believe will minimize risk, over all else. This does not mean that money, kids, career or pleasure are bad things, rather they don’t deserve “love incorruptible”. If any of these are ultimate objects of love they will get in the way of God working in your life. First, you can blame the things that are disappointing you and try to move on to better one’s. Result: That doesn’t solve anything, only keeps you on the cul-de-sac of emptiness. Second, you can blame yourself and beat yourself up. “I’m a failure…there is something wrong with me.” Result: self-loathing and shame. Third, you can blame the world. “you know what’s wrong in the world…men.” Result: make yourself hard, cynical and empty. Fourth, or you can reorient the entire focus of your life toward God. The essence of the Christian faith is to be fully yielded and surrendered to Jesus as primary object of love. That’s what it means to love him most and for your loves to be rightly ordered. The truth is that our love for God is nominal because deep down we believe that God is a nominal lover. Our lack of love has less to do with being lukewarm, stagnant or ambivalent and more to do with not seeing God rightly – in all his grace, goodness, glory and love. He wants to lead us out of comfortable, affluent, safe lives to deeper trust, Spirit-led risk and incorruptible love of Jesus. He doesn’t beg us to give him a little slice of our lives. He commands everything from his followers, because he has given everything for them. Radically loved people, love radically. This is biblical Christianity. The Bible calls for ordinary, yet radically loved people, like Tychicus (and us), to give up our lives to the One who gave it all up for us. Q: What would you life look like if you lived with gospel intentionality, motivated by love of God?